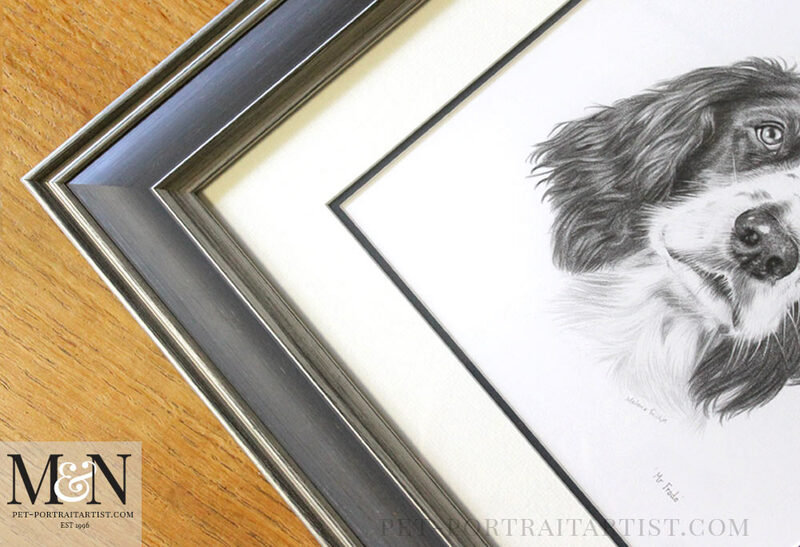 Welcome to my drawing of a gorgeous spaniel called Mr Frodo, one of my latest spaniel pencil portraits to come off of my easel. 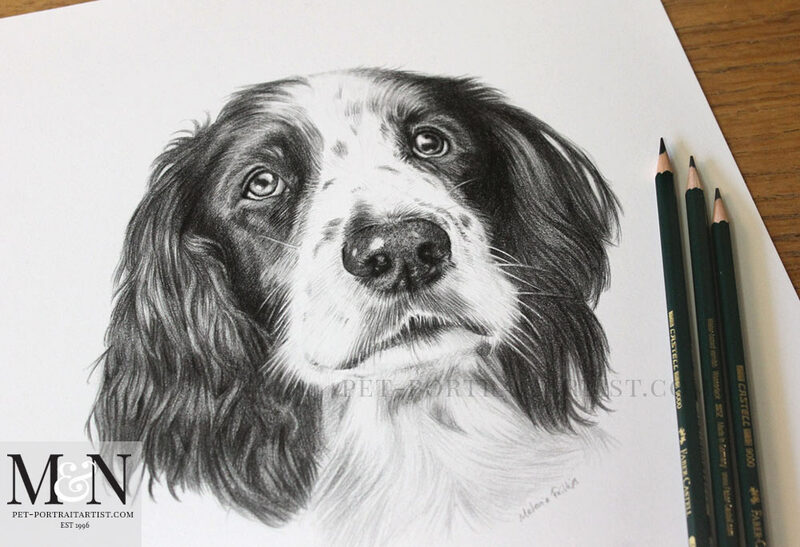 I have completed many spaniel drawings this year, my next drawing is a spaniel too. 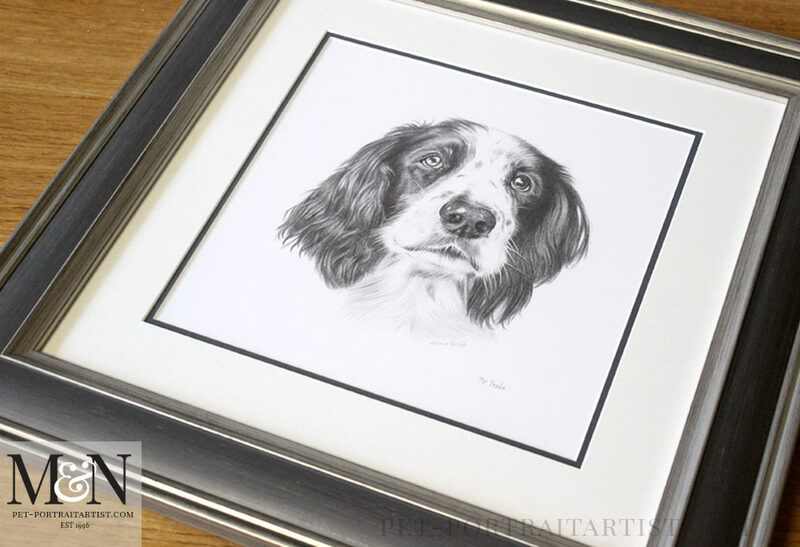 Returning client Jennifer commissioned Mr Frodo as a birthday surprise for her father called Dave. You can see the previous portrait of Aspen and Susie, two beautiful Great Danes Jennifer commissioned for her husband – Great Dane Pet Portraits. 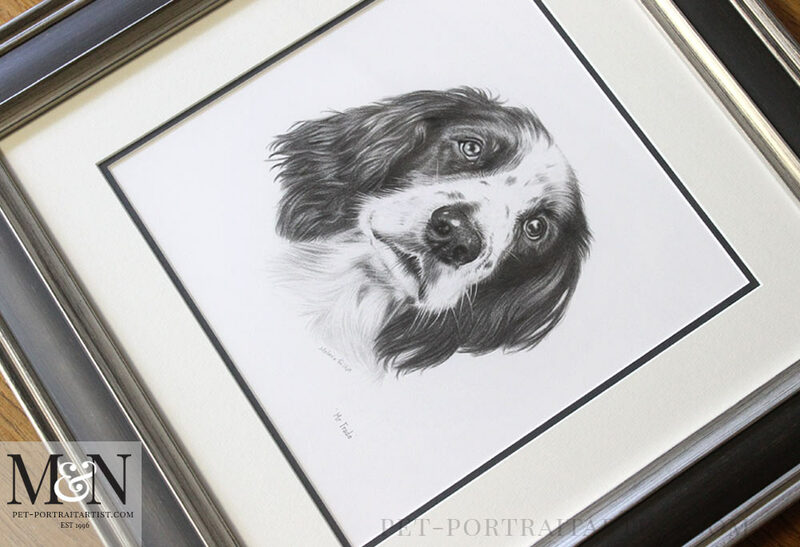 This portrait of Mr Frodo was commissioned at a custom size of 11 x 11 inches due to the shape of Mr Frodo’s ears and so made it square in shape. 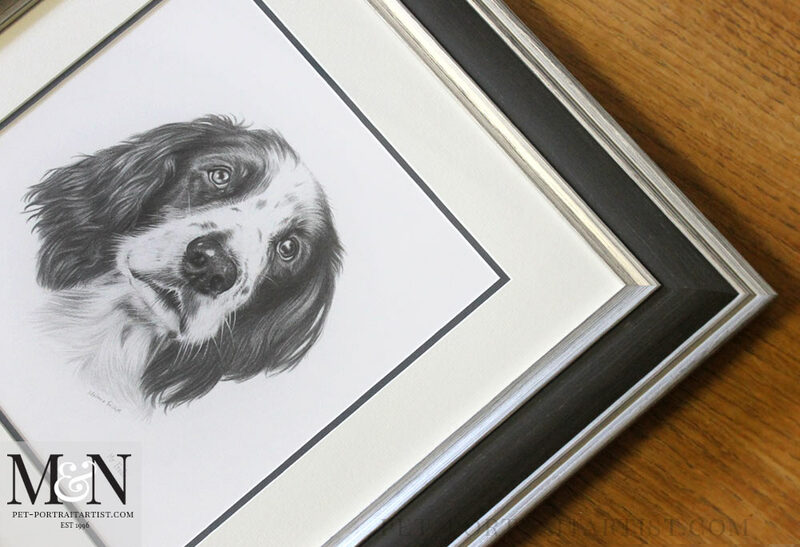 It was then framed in our Madison Slate frame which you can see if you scroll down below, along with some photos of the drawing with my pencils. You can also read a testimonial from both Jennifer when she saw the final scan and her father when he received the portrait below. I love it, it looks beautiful. Here are a few photos of the drawings with my pencils to help show scale. I hope that they show the drawing of Mr Frodo in a more candid way. 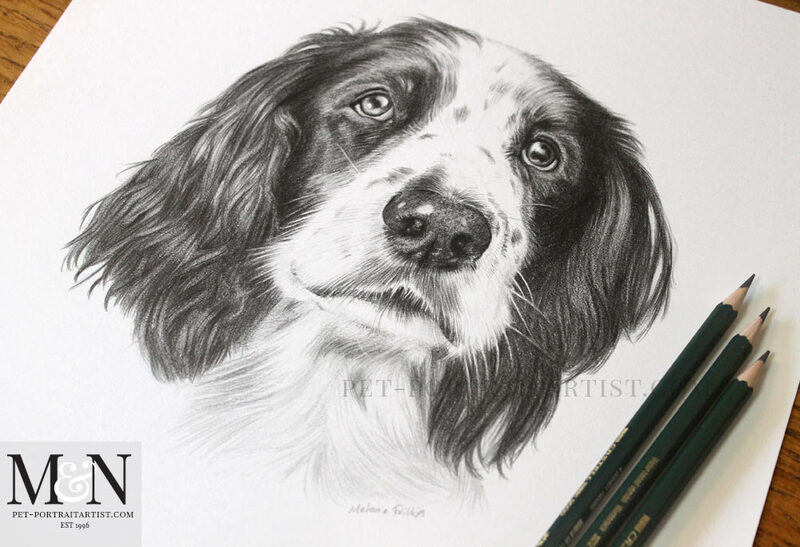 I thoroughly enjoyed drawing him and I really hope that the drawing will be a lovely surprise for the recipient. 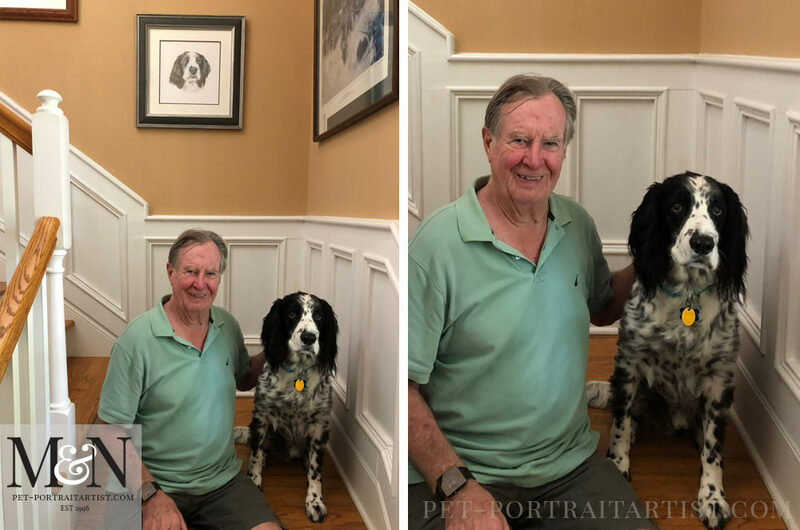 Dave very kindly emailed me the most wonderful testominal and photo of himself with his portrait displayed on his wall, sitting on the stairs with Mr Frodo. I cant thank Dave enough for taking the trouble to do this for me. I will be adding the photo and Mr Frodo on my website very soon! Thank you Dave! 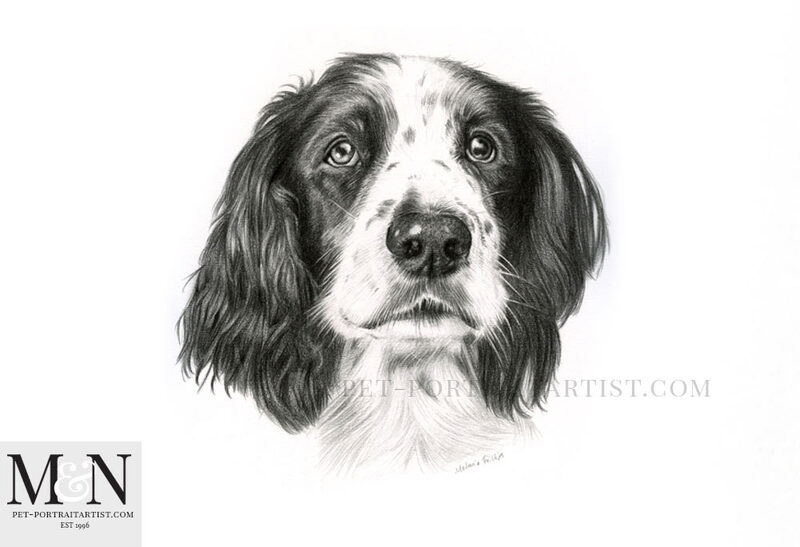 I just adore your work product; you captured my hunting partner MrFrodo perfectly. Mr F is more a “bigger than life” presence than a simple family pet. My father before me and now I have had many English Springers but never one quite like Frodo. He’ll be 12 years young in March and is still a ball of energy! Thanks again for your work, it’s greatly appreciated. 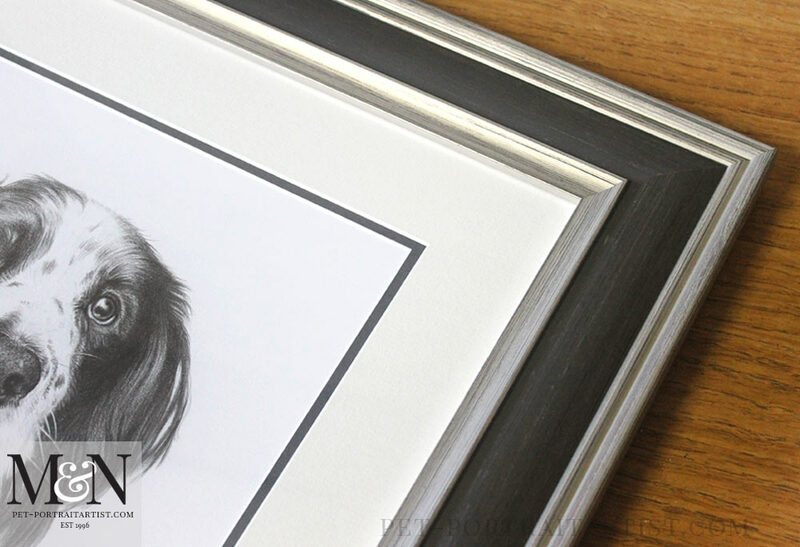 We framed the portrait in our Madison Slate frame. Our framer Amanda is absolutely brilliant. She coupled the Madison Slate frame with the hayseed cream textured mount and a dark grey inner mount. 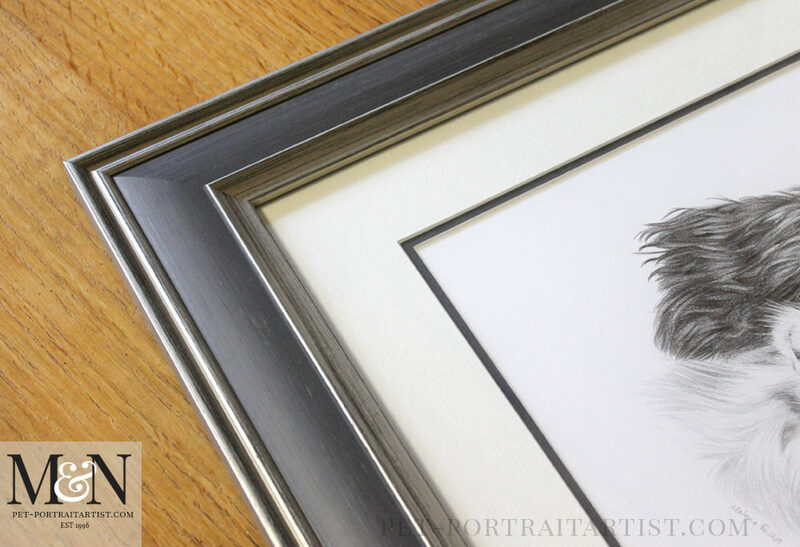 The inner mount is a dark grey which really accents the drawing and frame beautifully. This is the first time we have used the Slate version of the Madison and we absolutely love it. I am sure it is going to be a firm favourite. Finally, we hope that you have enjoyed viewing our Art Studio Blog. Why not sign up to our Monthly newsletter accessible at the bottom of our website which comes out on the 1st of each month. Consequently this means, you can catch up on all of the portrait stories and news from our Art Studio! Please don’t forget to subscribe to our Youtube Channel too, share, like and follow our social media and you are more than welcome to comment below, we love hearing from our readers!